James Mitchum stars in this unimpressive American-style Spaghetti Western from Sergio Corbucci. Koch Media Germany R0 release. The year after Sergio Leone made the first really sucessful Italian Western, the stylised and distinctive Fistful of Dollars (1964), his friend Sergio Corbucci directed Massacre at Grand Canyon. 1965 was a defining year for the genre - producers had realised the potential for shooting Westerns in Europe, but audiences had not come to accept it yet and filmmakers were wary of doing anything to mark their film out as a European production, so the ambience and storylines remained the same as the Classic American Westerns, actors and directors names were changed to make them look more American and actors were imported from the States to get a marquee name on the billing. In keeping with the Classic American Western feel of the film, the storyline is very basic - a man (not a pure hero but not quite an anti-hero) trying to keep the peace between two quarrelsome factions and trying to save the woman, with the usual family ties in there as well. There are some hints of what Corbucci was to do next - the lead character is enigmatic, a great shot and interested in keeping the peace over any loyalty to factions, but don't expect any big twists, politics or moral debates in this film, its just straight forward Western. Pacing is pretty standard, although there are big gaps between the shootouts that might bore the action junkies. The film builds to a dramatic, but ultimately predictable conclusion. As with the storyline, Corbucci directs this film in a pretty standard way, his trademark 'look under the rim of a hat' shot and distinctive gunfight angles are missing but he does go in for some good handheld shooting during a fist-fight sequence. Ultimately this film is your standard Western with some decent looking sets, a well mounted climactic gun battle and some good location shoots - most interesting is the fact that the film was shot in Jugoslavia, which at the time was being used by various German film crews shooting the popular Karl May Westerns, but would rarely be used by the Italian Westerns. The soundtrack from composer Gianni Ferrio is a mix of European and American influences, with a Spaghetti-style opening song but a standard American Western soundtrack for the rest of the picture. As was common at the time, helping the film to masquerade as American production, Sergio Corbucci is credited as Stanley Corbett and an American Western actor is brought in for the lead role - James Mitchum (son of legendary actor Robert Mitchum) gives a competent but rather flat performance here. Betraying its European roots is the selection of familiar character actors including George Ardisson (star of Mario Bava's Viking adventure Gli Invasori (1961)) in a rare bad-guy role that he really seems to relish, and Giacomo Rossi-Stuart (who appeared in Mario Bava's horror film Kill, Baby, Kill (1966)) as the town sheriff, while fans of the Karl May Westerns should recognise Vladimir Medar who plays the leader of the Whitmore gang. 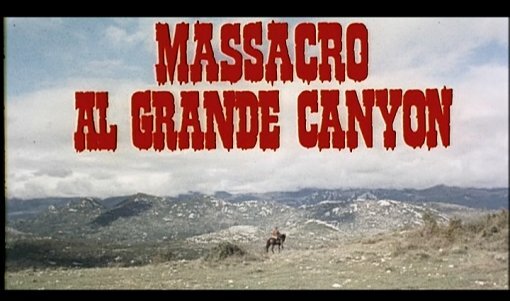 Massacre at Grand Canyon is a very average Western with little to distinguish it - only the familar character actors give away the film's European roots - but it is solidly produced and rarely dull, and should entertain most Western fans. Corbucci fans looking for films of the quality of his later productions will be probably be disappointed. Anyone famous in it? James Mitchum - son of actor Robert and star of little known war film Ambush Bay (1966) and a few Westerns. Directed by anyone interesting? Sergio Corbucci one of the best directors of the Spaghetti Western era who also shot the iconic Django (1966) and the political/comic masterpiece Companeros (1970). Western fans should find it somewhat enjoyable but very different to most Cobucci and Spaghetti Westerns. Visuals 1.85:1 non-anamorphic wide-screen. Colour. Most of the print is strong, with good colour and detail but some notable speckles. In one short scene the print quality is much lower, VHS quality. Both tracks sound fine, some hiss and crackling. The German track has a different musical soundtrack of stock themes (suggesting it was probably dubbed later). Cuts? The film is believed to be fully uncut. Print used is Italian, with Italian language credits and title, although the German title has been digitally (and rather shoddily) added to the opening credit sequence. A very average film with solid production but nothing that stands out. With many better SWs out there, this is not particularly recommended. A mostly strong print with a decent English track. Non-anamorphic and light on features. Find our reviews of other films directed by Sergio Corbucci. All text in this review written by Timothy Young - 21st July 2006.